Pamela Howard Shriver (born July 4, 1962) is a former American professional tennis player known primarily as a doubles specialist with success also as a singles player. She currently is a tennis broadcaster for ESPN. During the 1980s and 1990s, she won 133 titles, including 21 women's singles titles, 111 women's doubles titles and one mixed doubles title. In Grand Slam tournaments, Shriver won 21 doubles titles and one mixed doubles title. She also won a women's doubles gold medal at the 1988 Olympic Games in Seoul with Zina Garrison as her partner. Shriver was well known for her variety, including sharp volleys and all-round solid technique at the net. She also possessed a strong slice forehand and underspin approach, which set her apart from the rest of the women's field, but had a comparatively weak chip backhand. She was known for being a serve-and-volleyer. Shriver first came to prominence at the 1978 US Open where, as a 16-year-old amateur, she reached the women's singles final. She defeated the reigning Wimbledon champion, Martina Navratilova, in a semifinal. Shriver then lost to Chris Evert in the final. This early singles achievement proved the pinnacle of her singles success. 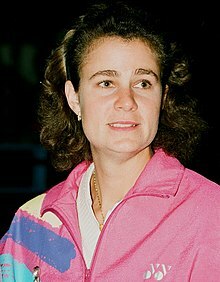 Shriver also won her first career singles title in 1978 in Columbus, Ohio, and yet won a total of just 21 singles titles between 1978 and 1997. The 1978 US Open final was the only Grand Slam singles final of Shriver's career. She lost the next eight Grand Slam singles semifinals she played, four of them to Navratilova, two to Steffi Graf, and one each to Evert and Hana Mandlíková. Shriver achieved numerous successes in doubles tournaments with Navratilova, winning 79 women's doubles titles. Shriver won 112 career doubles titles overall and is one of six female players in the open era to have won more than 100 career titles. Navratilova and Shriver formed one of the most successful women's doubles teams, capturing seven Australian Open, five Wimbledon, five US Open and four French Open titles. In 1984, the pair captured all four major women's doubles titles, i.e. the "Calendar Grand Slam." This was part of a record 109-match winning streak between 1983 and 1985. The pair were named the WTA Tour's "Doubles Team of the Year" eight consecutive times from 1981 through 1988 and won the WTA Tour Championships title ten times between 1981 and 1992. Shriver won another women's doubles Grand Slam title at the US Open in 1991, partnering with Natasha Zvereva. She was also the 1987 French Open mixed doubles winner with Emilio Sánchez. She won all three gold medals (singles, women's doubles, and mixed doubles) at the 1991 Pan American Games in Havana, Cuba. Shriver reached the world no. 1 doubles ranking in 1985 and held it briefly before relinquishing it again to her playing partner, Navratilova. In the Federation Cup representing the United States, Shriver won 5 of 5 singles matches and 14 of 15 doubles matches. From 1986 to 1992, she played in 17 Federation Cup ties. She reached three finals with her compatriots, winning twice; in 1986 the US defeated Czechoslovakia (3-0); in 1987 the US lost to Germany (1-2); and in 1989 the US defeated Spain (3-0). Shriver has provided television commentary for ABC, CBS, and ESPN in the United States, the BBC in the United Kingdom, and the Seven Network in Australia. She has been providing coverage of various events since her 1996 retirement. During Wimbledon 2010, James Blake admonished Shriver for disrupting play with her overly-loud commentary from the box situated above the court behind him. This led to a verbal exchange between the two during the match. USA Today characterised this as an embarrassing and unprofessional performance by Shriver. Shriver was the first player to use an oversized racquet, manufactured by Prince. Throughout the 1980s, she was ranked among the world's top 10 in women's singles, peaking at world no. 3. Shriver was elected to serve as president of the WTA Tour Players Association from 1991–94. Shriver has served as president of the USA Tennis Foundation and on the board of directors of the United States Tennis Association. Shriver was awarded the Ambassador Award of Excellence by the LA Sports & Entertainment Commission in 2002. Shriver was born in Baltimore, Maryland, to Sam and Margot Shriver. She first started playing tennis at the age of 3. She graduated from McDonogh School in Owings Mills, Maryland. She is a minority owner of the Baltimore Orioles and is active in various charitable organizations. Her first husband, Joe Shapiro, a former Walt Disney Company lawyer, died of non-Hodgkin's lymphoma in 1999. In 2002, Shriver married actor George Lazenby. She gave birth to their first child, George, Jr., on July 12, 2004, and to twins, Kate and Sam, on October 1, 2005. The family lived in Brentwood, California. In August 2008, Shriver filed for divorce from Lazenby, after six years of marriage. Shriver has two sisters—Marion, who died from cancer in 1997, and Eleanor, who lives in Maryland—and is the fourth cousin of Maria Shriver, the former First Lady of California. Shriver is an ambassador for Up2Us Sports, a national non-profit organization dedicated to supporting underserved youth by providing them with coaches trained in positive youth development. ^ a b c d e f Pagliaro, Richard (April 7, 2011). "Gear Talk: Q&A With Pam Shriver". Tennis.com. Retrieved September 27, 2014. ^ a b "Pam Shriver". International Tennis Hall of Fame. ^ "National Speakers Bureau biography". Archived from the original on November 8, 2007. ^ "Shriver's profile on the Federation Cup website". ^ "James Blake curses Pam Shriver – during his Wimbledon match – Game On! : Covering the Latest Sports News". USA Today. June 22, 2010. Retrieved May 17, 2011. ^ "LA Sports & Entertainment Commission Announces 6th Annual Golf & Tennis Classic; Los Angeles Times Sports Editor Bill Dwyre to be Honored". Business Wire. February 14, 2005. ^ "Topic Galleries". baltimoresun.com. Archived from the original on July 7, 2009. Retrieved May 17, 2011. ^ "Pam Shriver Joins Up2Us Sports As Ambassador". Southern California Tennis News. October 24, 2015. Retrieved April 14, 2017.